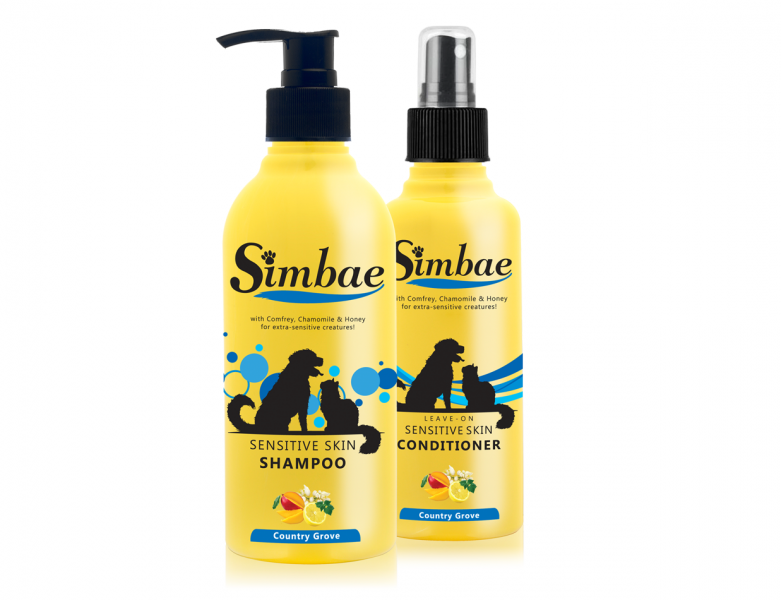 Simbae's Sensitive Skin shampoo adn conditioner is specially formulated solution for dogs and cats with tender and easily irritated skin. Sensitive Skin Shampoo is mild and pH balanced solution contains natural skin healing and pain relieving extracts, of Comfrey, Chamomile, Honey, Vitamin E and Aloe Vera. For further care, use Sensitive Skin Conditioner, to soothe your creature’s skin. The Sensitive Skin Bundle consists of Sensitive Skin Shampoo and Sensitive Skin Conditioner. Comfrey induce feelings of calmness and serenity. Honey helps to balance the skins moisture levels. Chamomile gives relaxing effects on the mind and spirit. Shampoo: Wet the coat thoroughly with warm water and apply a generous amount of shampoo. Massage deeply into the coat from head to tail and rinse well with warm water. Conditioner: Apply to either a wet or dry coat, lightly spray and gently brush through the fur while avoiding face and eye areas. This will extend time between baths and with regular use will bring beautiful natural lustre to any coat.